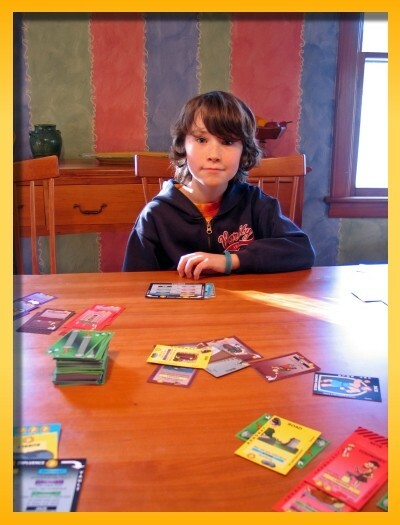 Sophie, Noah, and I played a game of Clans by Leo Colovini tonight. It’s safe to say that I’m already a Clans fan given I spent a considerable amount of time writing my own Clans implementation for Marquand.net but I’ve never done a real review of the game. Clans depicts a point in our prehistory when our ancestors scratched out a nomadic existence. As resources in the territories became more scarce, the people became more desperate and conflicts arose driving small groups into surrounding territories. The game is played on a board depicting twelve regions made up of four terrain types (mountain, steppe, forest, grassland). 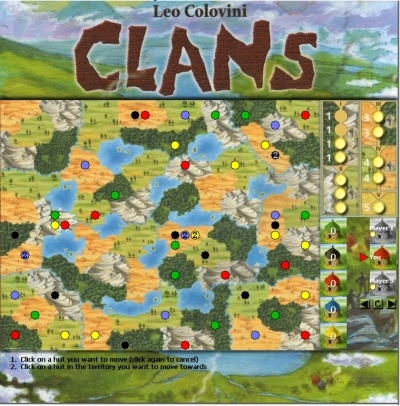 Each region is populated by five clan huts, one of each color, and one hut per terrain type making a total of sixty huts spread out on the board. The game has a unique characteristic that all colors are used no matter how many people are playing and your color is kept secret from your opponents. On your turn you move all of the huts from one region to an adjacent region on the board. The only stipulation is that you cannot move huts from a territory that contains seven or more huts (but you can add more huts to that territory) and you may not move huts into a region that is barren (devoid of huts). The game is played over five epochs depicted on the right hand side of the board. Each epoch contains from one to four tokens awarded when huts form a village (become surrounded on all side by barren territories). When huts coalesce into a village, the player creating the village is awarded the next token from the epoch chart and each color of hut represented in the village is awarded the number of points equal to the total number of huts in the village. In this way, colors that are not represented by a player can receive points during play. 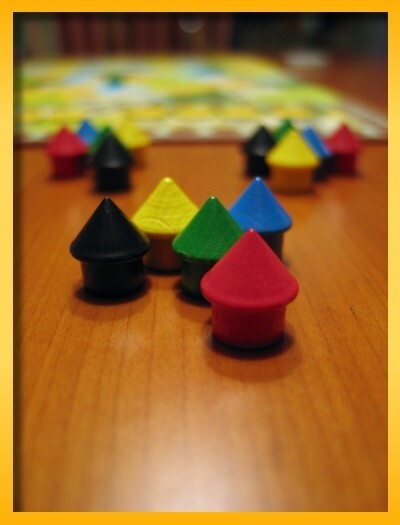 If all colors are represented in the village, strife occurs and any colors represented by only a single hut are removed from the village and then points are awarded using the remaining huts. Each epoch depicts two terrain types that receive special treatment while tokens are still available. The terrain type on the left indicates bonus points awarded to the villages formed on that terrain. The terrain type on the right indicates an ‘unfavored’ type where villages formed on that type receive no points (but the token is still awarded). The game ends immediately when the last token from the epoch track is awarded or when no more villages can be formed. 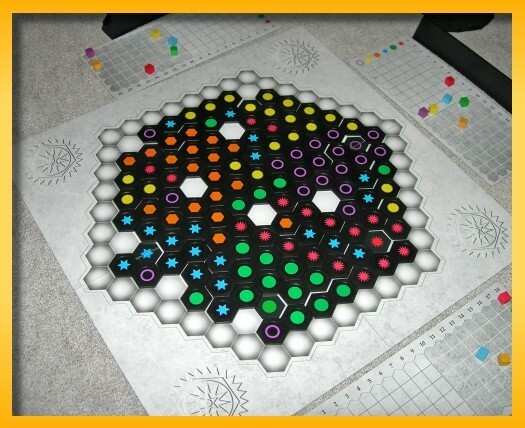 Players then expose their hidden color and bonus points are awarded to represented colors equal to the number of tokens received during the game. The player with the most points is the winner. The game is, for the most part, an abstract. The theme, although present, is irrelevant to the mechanics but it doesn’t conflict with the overall game play. I find the game an interesting beast. I’ve read comments that the game ‘plays itself’ but I’m not really sure what that means. My best guess is that players who agree with the statement, feel that there is little one can do to influence play. I wholeheartedly disagree with the statement! Clans is a game that I feel gives back the level of brain energy you put into it. If you act like it’s a brain burner then it will be. I enjoy the hidden color aspect of the game where you try to outfox your opponents into thinking you’re a different color; the hope being that they inadvertently reward you points by included you in their villages. I enjoy the brain-buzz you get analyzing your opponents moves in an attempt to determine what color they are. The more you know about another player, the better prepared you are to stranding them on an unfavored terrain or locking them out of points due to strife. I enjoy trying to force as many of my opponents huts into an every shrinking region causing them to lose the ability to influence other parts of the board. And finally, I enjoy trying to outguess my opponents moves; should I make the village now or should I wait…. The game is somewhat of a pain to setup. Although different every time, there is a strategy to organizing the huts so that you get an even distribution of colors when the game begins. It’s not a game I enjoy playing every time I sit down but I do enjoy it. It plays fast and is enjoyable across the 2-4 player range listed on the box. As an added bonus, my kids enjoy it and, for the most part, understand the strategy. A recent geeklist on BGG enumerated the history of the site and how it’s changed over time. This month is seeing about 25,000 visitors/day with 86,000 registered. I hate playing with an incorrect rule. Arg! After checking the rules, you can show all of your tiles to your opponents and restock all of your tiles from the bag (and then throw in your previous tiles) if you do not possess any tiles with the colors shown by your lowest cubes on your scoring card. I was playing under the assumption that if you had more than one color of cubes tied for last on your scoring card that you could not swap your tiles. My rules clearly state “any of the colors” indicating that there can be more than one. 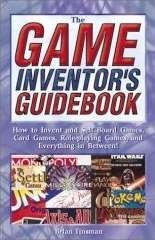 I recommend the book to all gamers even if you don’t think you will ever design your own game. 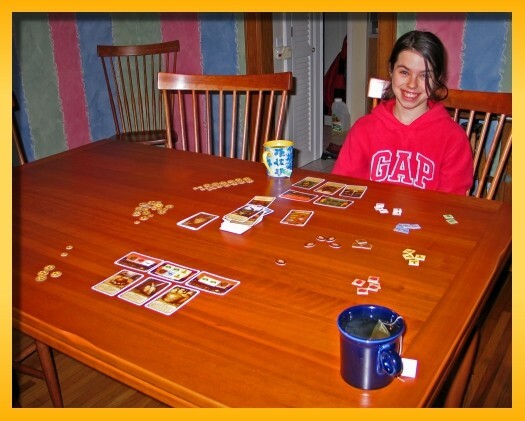 I really looked forward to cracking open Glory to Rome, a card game from Cambridge Games Factory (CGF). CGF touts Glory to Rome as a their first “Gamer’s Game” offering for 2-5 players. The game is a significant step up in complexity from their more family oriented games I’ve reviewed (Sneeze and Ice Pirates). Some might compare Glory to Rome with San Juan but I find the comparison somewhat of a stretch. There are hints of some San Juan characteristics in the game but overall, the game plays and feels significantly different. The game is composed of 180 playing cards: 144 Orders (40 unique cards in 6 suits – Purple/Patron/Marble, Blue/Merchant/Stone, Red/Legionary/Brick, Gray/Architect/Concrete, Brown/Craftsman/Wood, Yellow/Laborer/Rubble), 30 Sites, 5 Jacks, and 1 Leader; 5 oversized Camp cards; 1 oversized Rome Demands card; and 6 plastic Merchant Bonus chips; a rule book; and another book detailing the special powers granted by each type of building. 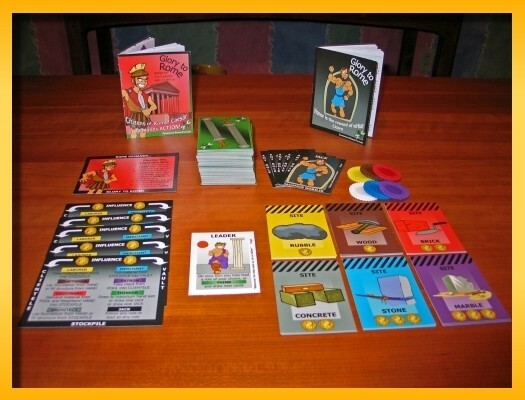 CGF has continued their “Boardgames in a Bag” packaging using a zip-lock style bag. I found the card-sleeves difficult to reuse and the bag too small to repack the game. I’ve abandoned the zip-lock bag and now use custom tuck-boxes. 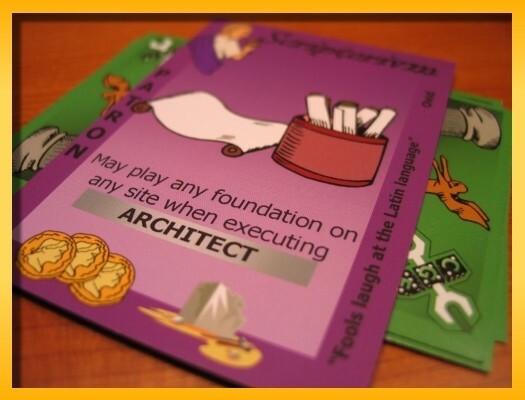 The theme of the game calls for you to enlist the help of several types of Clients (Patron, Merchant, Legionary, Architect, Craftsman, and Laborer) in rebuilding the Structures of Rome using 6 different types of materials (Marble, Stone, Brick, Concrete, Wood, and Rubble). These 6 types of clients serve different roles in the game and grant you certain abilities when you invoke/execute their specialty. The goal of the game is to amass the most Victory Points (VPs) collected in several ways: completing the construction of Structures, banking cards in your Vault, building specific structures, and having the most of certain kinds of cards in your Vault granting you Bonus Merchant chips. The game ends immediately when any one of the ending conditions is met: when the draw pile is exhausted, when all Site cards have been claimed, and somewhat oddly when certain Structures are completed (more on that later). 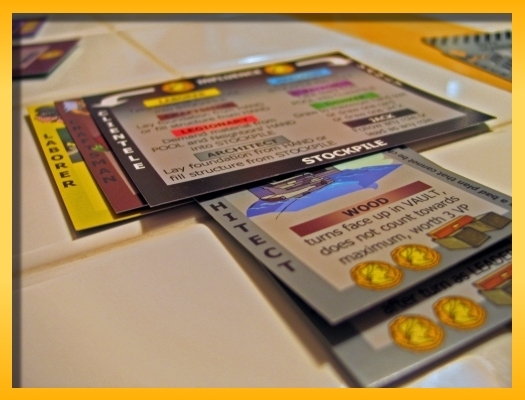 The Order cards serve different purposes in the game depending on context. The left edge of the card states the name of the Client the card represents and thankfully the number of suits matches the number of Client types and their assignment is always consistent (e.g. Yellow is always the Laborer, Purple is always the Patron). The bottom edge of the card depicts the number of VPs the Structure is worth as well as what type of material is required to complete it. Each player receives an oversized Camp card that sets in front of the player. The Camp card is segmented into 4 areas: the running total of VPs, the Clientele (the Clients that have been enlisted to help), the Vault (an area to bank VPs), and the Stockpile (the area where materials are stored before using them to advance a Structure towards completion). 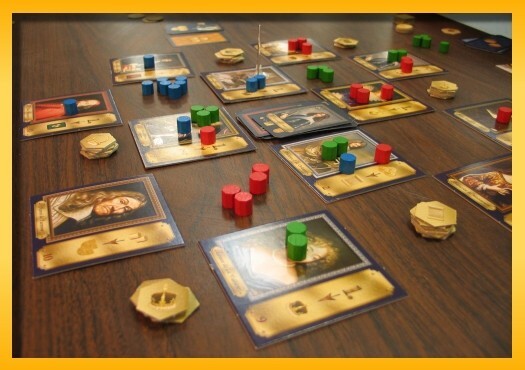 Play progresses quickly with each turn divided into two distinct phases. The starting player leads one of 6 types of Clients and players may follow that lead by playing a matching Client card from their hand. If a player wishes not to follow, they may draw cards from the draw pile. The second phase of the turn involves executing the specialty of the lead Client. Each player who followed the lead or already has that Client in their Clientele is allowed to execute the role of the Client. 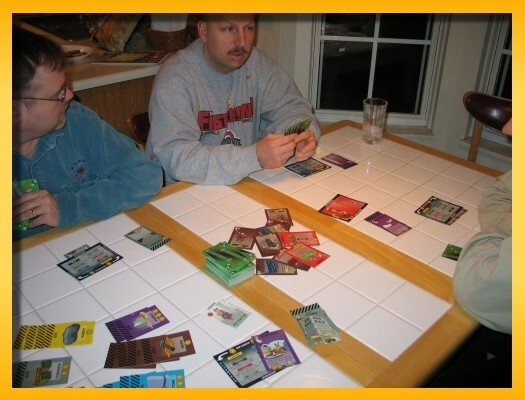 The Clients allow players to pull cards from a common pool in the middle of the table, begin construction of new Structures, move cards from their hand onto Structures under construction, move cards from one area of their Camp to another area, etc. In most cases it requires finesse, multiple turns, and/or a healthy does of luck to migrate useful cards from one location to another location where they can be of benefit. 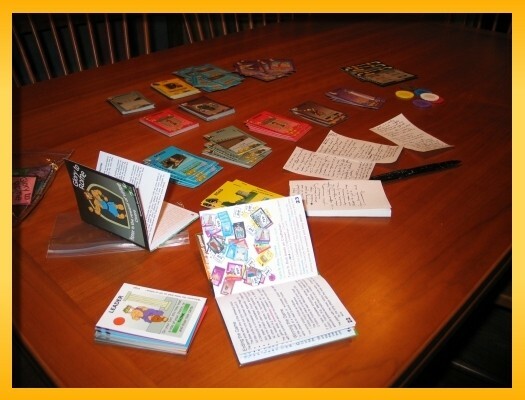 Since each card serves different purposes, players have several options as to how to use the card depending on where the card ends up in their hand or in their Camp. 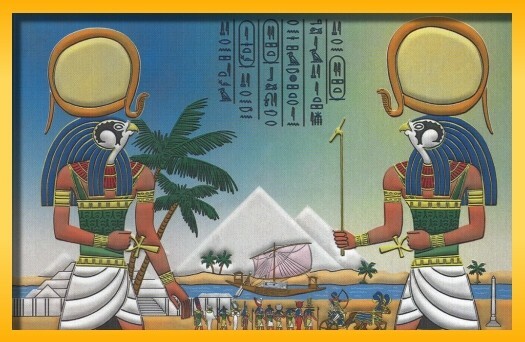 Each Structure possesses a Special Power (stated on the card) that can be invoked after the Structure is complete. The Special Powers vary wildly from those that can be used only once, those that keep paying off on every turn, and those that only count towards VPs at the end of the game. The sheer number of different Structures available make it difficult to 1) remember what the Structure allows you to do, and 2) incorporate a specific Structure into your strategy. I like Glory To Rome but I find the play very chaotic. Planning ahead to make the best use of your Vault and your Clientele does require strategy but overall play is highly tactical. As the game progresses the Special Powers of the completed Structures begin to turn the straightforward mechanics into a chaotic check of what powers block others, what powers should be invoked when, and constant monitoring that you didn’t forget something that could have helped you. Things can get bizarre when the Prison Structure has been completed since this allows a player to steal another player’s completed Structure. The stolen Structure may leave a player’s area in an invalid state (since it may have required the Special Power of the Structure to exist in the first place). The rules allow the invalid state to remain but I get uneasy if I must rely on memory rather than visible game elements to validate my position. I found the game’s ending conditions somewhat troublesome. Ending the game when the deck runs out or when the last Site card is claimed is something that can be planned for. The other ending conditions either cause a game to last an indeterminate amount of time or can be used as a King Maker (when a player ends the game in such a way that decides another player will be the winner). The fiddly Camp card runs counter to my desire to keep my play area clean and orderly. On more than one occasion my sleeve scraped through my Camp destroying any semblance of order. I cannot think of a better mechanism to keep track of your cards so I really can’t complain too much. I do like Glory to Rome and I really feel there is a good game in there. The core of the game is sound and I enjoy the tactical play but I found the number of different Structure types difficult to remember. The artwork is inconsistent showing cartoony images for most of the cards but more realistic, CGI-style renderings on other cards. I think the game could benefit from a less cartoony feel given the target audience. The outcome of the game is primarily luck-based since it’s difficult to plan which Structures to build. The end game is very chaotic when the Special Powers turn an otherwise clean game into a a rush for banking VPs and/or a rush to end the game by claiming the last Site card. If you’re looking for a highly tactical card game with more depth than most but still on the lighter end of the scale, then give Glory to Rome a shot. Most gamers will be able to pick up the rules without issue. I have played with my 9 year old ‘gamer’ but the number of Special Powers in play by the end of the game was difficult for him to grasp. Playing without Special Powers may be an option when playing with younger gamers. I taught Noah Glory To Rome today. He got the hang of it pretty quickly and really came back at the end once he got the hang of using his Laborers to fill his Stockpile and then use his Merchants to fill his Vault. We tied on the number of VP’s from building sites and it came down to the number of vaulted VPs (and bonus chips). We played with three exposed Site cards rather than two after I read that it can make the 2-player game a little more interesting. At a recent CABS night I was looking through the game lockers for something to play and saw Hansa. I own a copy and have played it with Sophie and Noah, but being curious about how game play changes in different audiences, I asked if anyone wanted to play. The response was pretty much what I expected and tracks pretty well with the prevailing sentiment on BGG: “Hansa’s okay but a little dry”. What makes a game dry? Are dry games always dry or do some morph into being dry in only some circumstances? Is there a common thread across games considered dry? Is there something fundamentally wrong or unbalanced about a dry game? In beginning my search for a definition I came across this essay on the The Perfect Martini. Now, I’m not a Martini connoisseur but I have sampled enough different varieties to have an opinion. The essay intrigued me on many levels since Lisa and I debate what makes a good Martini. Lisa is a ‘true’ Martini aficionado; “If it doesn’t have Gin…it’s not a Martini”. I’m the new kid, preferring a Vodka Martini over the ‘cup-o-Christmas Tree’. I began reading and started seeing many similarities between the Quest for the Holy Martini and the Quest for the Holy Game. According to the author, originally the drink was not a Martini unless it contained Gin and Italian Vermouth (also known as Sweet or Red)…no ifs, ands, or buts. It was only after the rise of French Vermouth (also known as White or Dry) that connoisseurs would indicate a preference for French Vermouth by ordering a “Dry” Martini. The author further documents the demise of the term and its unfortunate transformation into describing a Martini served with an ever decreasing amount of Vermouth. As the balance of flavors became more and more skewed towards the strong botanicals in the Gin, bartenders turned to Vodka in an attempt to rebalance the drink. The use of Vodka, essentially a colorless, odorless, and tasteless form of alcohol, removed the strong botanical flavor and retained the desired ‘bite’ in flavor. However, the transformation created, paradoxically, an almost single ingredient mixer. Silliness aside, I don’t mean to imply that dry games are bad or unbalanced overall. I own several very enjoyable games that I would classify as dry. Instead, my point is that dry games, like dry Martinis, have evolved. They both have had ingredients removed from the mixer until specific flavors and textures become exposed and relatively apparent. In dry games, it’s the mathematical flavor and texture that has become exposed. If you create a scale where the left end represents games that rely solely on mathematical skill and the right end represents games that rely solely on intuitive play, then dry games would cluster towards the left end of the spectrum. Not good…not bad…it just is. If you’re wondering though, I also don’t mean to imply that intuitive play is not rewarded in dry games. For example, I would consider Tikal a dry game. I think the game is out-of-balance and skewed towards the end of the spectrum where players tend to ‘work out’ the optimal move through a series of calculations. I don’t discount the large amount of intuitive play that is required to be good at Tikal. Players must be able to evaluate a set of moves based on what they think their opponents will do. However, the game is primarily a mathematical puzzle of maximizing points with limited resources. In my opinion, the same holds true for Power Grid. What then is the recipe for a perfect Martini? I could simply tell you the proper ratio of gin and Vermouth to use, but all you would then be doing is following my lead. What I’d personally prefer is that you come to your own understanding of what you actually prefer, and not what somebody tells you is the right recipe. Author mattPosted on February 8, 2006 January 27, 2016 Categories All Posts, Board GamesLeave a comment on Got Vermouth? We held our February installment of Analog Game Night (AGN) at Keith’s house last night. Thanks for hosting Keith. Images of AGN Feb 2006 can be found in the gallery. Our first game of the evening was Rich’s copy of Elfenland designed by Alan Moon. I like the game well enough but I stink so bad at it. I never seem to have the cards I need at the time I need them. Tonight I kept having large numbers of the same card without the abiity to draw the right chips/tokens to make them useful for the terrains I needed to traverse. Maybe next time I can at least beat Paul. Next up was I’m the Boss (also known as Kohle, Kies & Knete) designed by Sid Sackson. Keith owns the German version and recently picked up the English reprint so this was our first stab at the game. The game is a completely new style of player interaction than we’re used to in our group but I think it worked out pretty well. There is tons of backstabbing and simultaneous deal making and breaking. We had lots of laughs and I’m sure we’ll play again. In a highly competitive environment I’m not sure it would work very well, but in our group we did pretty well. You can listen in on a bit of the interaction if you want. Our last game was Glory to Rome designed by Carl Chudyk from Cambridge Games Factory. It was our first play and we didn’t start until around 11pm. My plan is to review this game after a few more plays but the initial feedback is that it feels like there is a good game hidden in there but there are some odd vibes. More on Glory to Rome as I play more. …entered into an intensely spiritual period during initial formation in which a candidate comes to a decision (with the help of the Master of Novices) whether or not to become a religious by profession of vows. The formation team (personnel) of the house also votes on the conduct and attitude of the candidate to decide if he should be promoted. I arrived around 7pm and there were roughly 100 gamers playing everything from dice games to Caylus, from Railroad Tycoon on a board the size of Montana to two men playing Memoir ’44, from a group of 6 playing an older paper-pencil based game to a small knot of younger guys playing some game involving tiny troll miniatures occasionally whooping it up with cries of dungeon explosions and cave jewels. I located the few people that I recognized from my first visit and managed to get in on a three-player game of Louis XIV. Louis XIV is a very enjoyable game by Rüdiger Dorn, produced by Alea and Rio Grande Games. My first taste of recalibration was the speed at which the rules were rifled off to me. I consider myself pretty good at picking up rules but I’m amazed at how fast people who have gamed a lot can pick up new rules. As I play more new games I have only recently been able to take aural rules and throw them into buckets and ignore the details of the words being spoken. For example, in Louis XIV, I saw an immediate resemblance to my ‘guys’ and El Grande’s treatment of caballeros in their provinces and their court. So in hearing the rules, I could throw hundreds of words into a few catch-phrases like, “guys are like El Grande”. Having played a sheer fraction of the games my table mates have played, this has to be what’s going on but at a higher plain than I’m even aware of. My second game for the evening was Reiner Knizia’s Ra. Ra was on my wish list for over a year and I never pulled the trigger on the purchase. Over time I lost interest in the game and took it off my list. It’s an auction/bidding game and I wasn’t sure whether I’d like it or not and didn’t want to spend the money to get a dud. I was pleasantly surprised with the game and would gladly play again. I felt some semblance of victory during this game since I came in 3rd of 5 rather than a distant last like I did in Louis XIV. Being able to play a game before buying it is where (I hope) my new membership will come in handy. CABS has a huge library of games available to members during the gaming night and for check out. I took advantage of the library system last night and checked out Louis XIV and hope to bring it to my normal game night this coming Monday. Up next, was Inkognito. I was lost the entire game. I’ve never felt so utterly lost in a game in my life. I could perform the mechanics of my turn and I understood the goal but I could not for the life of me understand how to get there. The game is best summarized as Clue on nuclear steroids. The goal of the game is to determine which of the four players is your partner, which piece of the board represents the ‘real’ them, determine their secret mission assignment, and together you must meet the goal defined by both your secret assignments (which might require you to know almost as much about the opposing team) to make your team win. It’s a game of deduction, elimination, and precise record keeping. There’s no table talk allowed and you exchange information by giving others sneak peaks of cards you have in your hand when they run into you on the board. The information you exchange can be false to not expose too much information to someone who might not be on your team or it can be totally true once you’ve deduced who your partner is. Again, the players at the table seemed to have no problem deducing their teammate and by the end of the game, I wasn’t even sure who I was let alone who anyone else was. I would gladly play Inkognito again but I might need to attain some higher level of enlightenment to, well, get it. 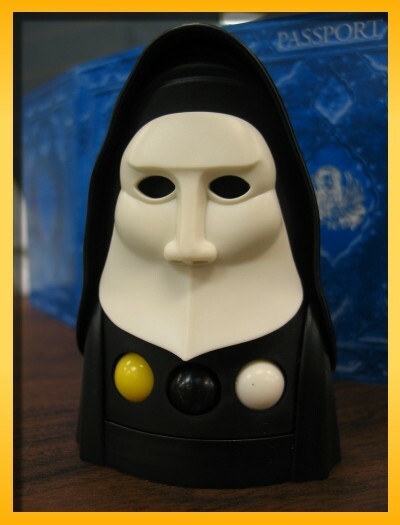 The one redeeming quality of the game was the ‘move roller’ mechanism that we dubbed ‘Nun-zilla’. You pick it up and shake it and then set it down causing three colored balls to fall into the slots determining what kinds of moves you can make during your turn. Neat! My final game was my copy of Amazonas. I was the only one who had played it and felt confident teaching it to the other three. By turn three (of 18) I knew I was screwed. I ended up 3rd being blocked out of lower cost villages on my secret route card. There was no way to recover and I should have just bagged my route card and tried to collect as many specimens as possible. I’m not sure there was a single question about the rules through the entire game. I pride myself on how I approach teaching a game but even I know I’m not that good at it. I can only think that during my explanation they were throwing back little nuggets of “secret cards = Ticket to Ride”, “Tents in villages for increasing cost = Power Grid”, etc. Sophie totally destroyed me in Jambo today 62 to 22. You might notice that I have three markets completely full ready to sell goods but I could not for the life of me obtain ware-cards appropriate for my market situation.